We tested the original Tamron superzoom in early 2009, citing its handiness and compact size as the main advantages. In the late-2010 refresh of the lens, Tamron has developed a new focusing technology using Piezoelectric drive, instead of an ultrasonic ring motor or conventional DC motor to drive the focusing elements. Additional changes include the use of rounded diaphragm blades, the use of 62mm instead of 72mm filters, and an overall reduction in size and weight. The 18-270mm is a Di-II lens, meaning it was designed for the reduced size of a subframe (APS-C) digital sensor. The lens ships with a petal-shaped lens hood, and is available now for around US$650. The lens is available in Nikon and Canon mounts currently, and will be available in a non-VC Sony mount in April 2011. Note: On September 6 2016, a slightly revised model (B008TS) was announced for the Japanese market which features a fluorine coating on the front element as well as updated styling. Click here for more info. The Tamron 18-270mm PZD (B008) plays a difficult game of design compromise, becoming a jack-of-all-trades, but master of none. Its performance can be segregated into two categories: wide-angle performance (18-70mm) and telephoto (100-270mm). The lens performs best in its wide-angle setting, with the optimum setting for sharpness being a toss-up between 35mm or 70mm at ƒ/8. When used wide-open at the wider angles (and yes, I recognize that technically, 70mm is certainly not a ''wide'' angle) there is some light corner shading, more noticeable in this sample in the bottom left and right corners. The center performs quite well at 18mm, offering its best performance at ƒ/5.6 - not tack-sharp, but close to it. In this wider-angle category, stopping down further than ƒ/8 doesn't produce significantly sharper results, and diffraction limiting starts degrading results by ƒ/11. Curiously, 50mm stands out slightly with a slight degradation in performance, between the 35mm and 70mm marks. In the telephoto category (100mm-270mm) sharpness performance isn't quite as good. Wide open at 100mm, we note quite soft performance in the bottom left and right corners (suggesting at least some de-centering in this sample) mixed with fairly good center performance. Stopping down to ƒ/8 or ƒ/11 clears up the corner softness quite well, but doesn't really improve central sharpness. The situation at 200-270mm is interesting; set to 200mm at ƒ/8, we note significant corner softness, again at the bottom left and right corners. Even at ƒ/11 and ƒ/16 it's still there. However, at 270mm performance is slightly better at ƒ/8 and ƒ/11 (while somewhat ugly at ƒ/6.3), suggesting to us that the lens has been specifically optimized to work best at specific settings within the focal range. Fully stopped-down performance is acceptable at 18mm and 35mm - just slightly soft, across the frame - but at 50mm and longer, it becomes quite blurred indeed, while providing very small apertures of ƒ/32-ƒ/40. Tamron handles chromatic aberration fairly well with this lens, especially in the mid-range. It's only at 18mm and at 200mm and above that significant CA can be found in the corners. Readers may wish to consult our sample photos for a more visual explanation. Between 35-70mm, corner shading isn't a factor with this lens. It's only in the wide angle (18mm) and at 100mm and above that light falloff presents a slight issue. At 18mm, there's always at least 1/4EV of corner shading, and if you use it wide open at ƒ/3.5, that increases to 1/2EV. At 100mm, 200mm and 270mm, you get 1/3EV if you use the lens wide open. Predictably, the complex array of lens elements that allows such a vast range of focal lengths in one lens leads to some dramatic results for distortion. When used in the wide angle configuration, the lens provides uniform barrel (''bloat'') distortion up to around 24mm, with dramatic distortion in the corners (1.25%, quite significant). After 24mm, distortion across the frame remains consistently barrel-distorted, but at a moderately low level (around 0.25%, on average) and the extreme corner distortion turns into the pincushion (''squeeze'') style. The worst pincushion distortion is noted between 35-70mm, where the corners show -0.8% pincushion distortion. Post-processing would be required to correct for these effects. 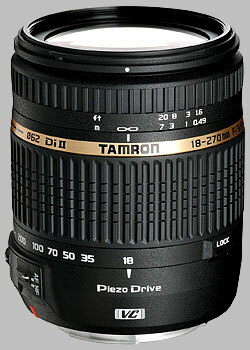 The Tamron 18-270mm uses a new autofocus motor, the PZD (Piezo Drive). The new motor is substantially less noisy compared to the older drive, and it's substantially faster - but it won't be setting any records in the speed department. It takes about a second to go through the focusing range. It may be that the increased throw range of the focusing ring (45 degrees instead of a slim 30) offsets an increase in speed. Also, you can't just override autofocus results by turning the focusing ring; you must select manual focus to do this. The original 18-270mm included a macro designation, and had a 0.29x magnification; the new lens only provides 0.26x magnification. The minimum close-focusing distance is still 49cm (just over 19 inches). The original Tamron 18-270mm was already designed to be relatively light by using a plastic chassis, but Tamron has managed to shave a further 110 grams (3 ounces) off the weight in this newer version. The lens mount is still metal and despite the plastic construction there is no noticeable rattling or flexing. The focus ring is mounted near the front of the lens, and the large zoom ring is found closer to the lens mount. Both rings use a nice rubber ridged pattern that is well dampened and easy to grip. The reduction in weight is likely accomplished at least in part by a small design concession; the maximum aperture size is slightly diminished when compared to the previous version of the lens. For example, on the new lens at 35mm, the maximum aperture setting is ƒ/4.5, whereas on the old lens it was ƒ/4. It's probably not much that'll require getting adjusted to (it's only a third-of-a-stop change) but it's worth noting. The lens is fairly uncomplicated to use; if you've used the original 18-270mm, the new lens presents no surprises. There are only two controls to speak of: one switch to enable or disable the lens' autofocus operation, and another switch to activate or deactivate the vibration control feature. A distance scale is indicated on the lens, in feet and meters; no depth-of-field scale is present, and nor is there an infrared index. The zoom function of the lens is controlled by the larger of the two rings on the lens, rotating approximately 90 degrees to extend the lens through its entire range of focal lengths. The ring is made of a tough rubber, with recessed ridges, and is a comfortable 1 1/8 inches wide. The zoom ring is nicely cammed and easy to turn - easier than the original version, it's also worthy to note. Zooming out to 270mm adds 3 inches to the lens' total length, going from a compacted length of 3 1/2 inches to almost double that, or 6 1/2 inches. Zoom creep is not a factor with this lens, however, it could become so over time, so Tamron has included a zoom lock switch to lock the lens at 18mm. The focus ring of the lens, located near the front of the lens, is a quarter-inch wide, composed of a deeply ridged rubber. There isn't a lot of travel for the purposes of manual focusing - approximately 45 degrees. Not great, but better than the original lens which had just 30 degrees of travel. The ring offers very little resistance though, so you may find getting the exact point of manual focus a bit tricky. There are hard stops at either end of the focusing spectrum, and the lens will focus past infinity. The front element does not rotate during focus operations, making life a little easier for filter users. The lens uses 62mm filters. Tamron employs its Vibration Compensation (VC) technology in this lens, claiming an improvement of four stops in hand-holding stabilization. Tamron suggests disabling VC when taking long exposures. We'll have our own IS test available for this lens shortly. The included DA18 petal-shaped lens hood reverses onto the lens for storage. The hood is ribbed on the interior, and when mounted, adds almost 1.5 inches to the overall length of the lens. Compared to the original 18-270mm, the new 18-270 PZD offers faster and quieter autofocus. Sharpness is better in some cases, worse in others; distortion and corner shading results are about the same, chromatic aberration resistance is slightly improved. The lens isn't as ''fast'' optically as the previous version; its maximum aperture decreases more rapidly, but this has allowed the lens to be smaller and lighter. About the same price. The Canon 18-200mm doesn't offer the same zoom reach, but the difference between 200mm and 270mm isn't huge. The Canon is sharper than the Tamron, though offering the same or slightly poorer performance relating to chromatic aberration, corner shading and distortion. Perhaps the best of the superzooms, the Nikon doesn't offer the same reach, but if one were to pick the nits strongly enough we might say it's got the best sharpness performance of the lot. Great resistance to chromatic aberration, except for the extreme corners - though the Tamron handles distortion and corner shading a bit more gracefully. However, the most expensive in this lot, too. The Sony is surprisingly inexpensive, less costly than the Tamron, and almost matches the Tamron in its reach. The Sony is on par with the Tamron for sharpness (each has their own foibles) and offers slightly better tolerance to CA; however, the Tamron distorts slightly less and has less corner shading. The Sigma 18-250mm offers almost the same reach as the Tamron, and is the most economical of the bunch. However it has some deficiencies relating to sharpness, especially when used wide open. Chromatic aberration is also fairly evident when using this lens. On the flip side, it's probably the best performer when it comes to distortion and corner shading, with the lowest test results. As you can see in the alternatives section, the manufacturers have realized that they can't afford to ignore the travel zoom market, and there is plenty of choice for all camera brands. Tamron leads the pack with reach, though not by much; the actual difference between 200mm, 250mm and 270mm is not a whole lot to write home about. The 18-270mm ƒ/3.5-6.3 PZD is, for the most part, an improvement on the original lens, especially concerning autofocus performance. It's now significantly faster and much quieter. However, there's not much relating to improved lens performance, so it is probably a design story about maintaining an existing level of quality. If you were bothered by the autofocus performance of the old 18-270mm, it's worth the upgrade; if you're looking for the absolute most telephoto reach in the smallest conventional package, it's worth the sale. But I wouldn't rule out other alternatives, especially if you want the best performance for sharpness or other quality indicators. This review is based on what this lens is designed for, not compare it to professional zoom and prime lenses. You have to understand what this lens is designed for. It is not to replace your 24-70mm (17-50mm) + 70-200mm + 300mm lens combo in terms of image quality, but weight saving instead. It is a travel zoom lens. It is designed to be as convenient as possible, instead of produce the sharpest images with extreme shallow depth of field. The best way to describe this lens to think of it as your 18-55+55-200/300mm kits lens merge into one. It has problems performing in low light conditions. The focus speed will drop and often struggle to find focus if you don't use the cross type focus point at the tele end. That being said, it works will in most conditions. It is not a sport lens either, the focus is too slow for that. However, it is fast enough to capture your kids or pets running around on the field. In terms of distortion, it is quite bad. However, it is not really noticeable in real world shooting. It is bad news if you are really into brick wall photography though. From 18-35mm(depends on your focus distance) you get barrow distortion and then pincushion after that. VC works well. I can get most images sharp at 270mm 1/30 sec. So that's about 3 stops improvement. Not bad. It is a bit noisy though. It also takes about 0.3 sec to get into position. The is a "jump" you see on a view finder that may scare the first time user. It is not a fault, but rather how the VC is designed. It is not really a problem, because it generally takes longer to lock on focus than take a picture. In a very unlikely event, you take a picture when the "jump" happens. It may result a blurry picture. It is a shame it has no manual focus over ride. Sure it has the PZD motor, which is a upgrade from the pervious micro motor, but there are few times I accidentally turn the focus ring while it is on the auto setting because I'm so used to working with lenses that has the manual over ride function. So really, you have to look at this lens as what it is designed for. It is a great lens if you just want a do-it-all type of lens. You will be disappointed if you compare it to...say a prime or modern f2.8 zooms. distortion evident at wide angle, sometimes hunts to focus in low light. Got this lens as Open box but obvious price mis-print for only $119. This lens at wide angle range 18-55 took sharper and more vivid pictures than the stock Sony SAM II 18-55 which I also own. The Sony SAM II did have quite a bit less distortion at 18mm, but software like DXO can fix that. Even though it says it Zooms to 270, the details in the photo information says 280mm focal point, which is a plus, an extra 10mm. The many reviews I have read about this lens tend to be a little harsh. It's far from perfect, but it gives you an incredible reach in a very small and light format. 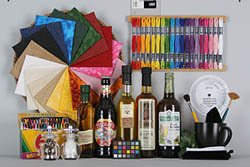 Autofocus is fast, color rendition and general image quality is predictable. 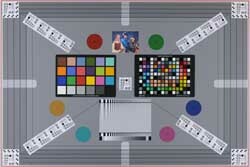 If you don't want to have to fix distortion in post-prod, keep clear from all the lens in the 18-200+mm group! I've had the Nikkor 18-200 mm VR before to compare with. I purchased this as the old version was told to be a bit sharper than the Nikkor, but with a very slow AF, which I'd not accept. This version surely has a better AF, though not quite as fast ad the Nikkor yet. It also has an effective VC, BUT it makes an annoying whining noise! I don't do videos, but for people with this interest, I guess the VC would have to be off. Even just using it for stills, the noise just got on my nerves. Not even the cheapest Nikkor VR lenses make that kind of noise. And speaking of cheap. The build quality just isn't a match for the Nikkor 18-200 and I wouldn't trust this lens to last many years, which it should at the price point it sells. Sad, since the IQ definitely is on top compared with other superzooms. I've read other comment on the 270 mm isn't truly 270 mm and I got the same feeling that it breathes a lot, so I didn't really fell it being much longer than the 18-200 mm Nikkor. At 18 mm it has very pronounced field curvation, so don't try to shoot straight lines.. If I was to rate it for shaprness alone, I'd recommend it, but it just has to many other small issues for me. Image quality seems fine. Even at 270mm it seems outstanding. The VC is a big problem. I have asked Tech support to help. Lets see where that goes.